P.F. 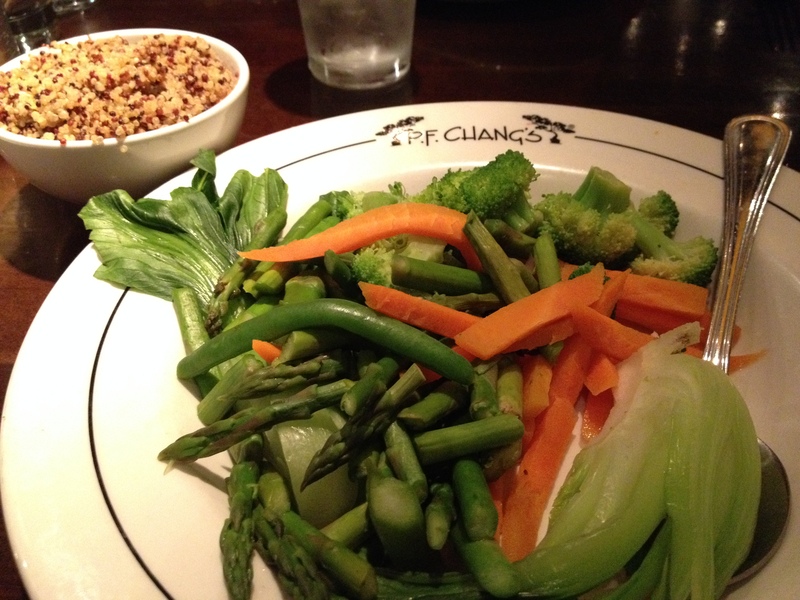 Chang’s has won a lot of praise for their gluten-free menu, and on the whole, that recognition is well-deserved. I’ve had many great meals at P.F. Chang’s. That said, I’ve also had a few not so good experiences. 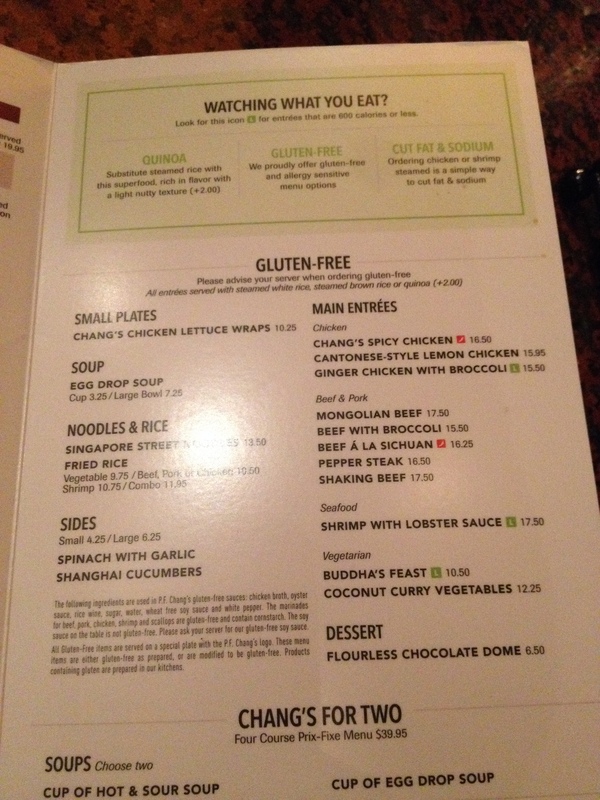 What Chang’s has going for it is a good variety of gluten-free options, including two vegan ones, staff knowledgeable of gluten-related concerns and nice precautions to prevent cross-contamination. The two vegan options are a steamed Buddha’s Feast, basically a steamed veggie plate, and a coconut-curry vegetable dish with tofu, baby bok choy, tomatoes, carrots, red peppers, mushrooms and peanuts. For sides, they offer spinach with garlic and shanghai cucumbers. As with every dish, you choose from either brown rice, white rice or rainbow quinoa. 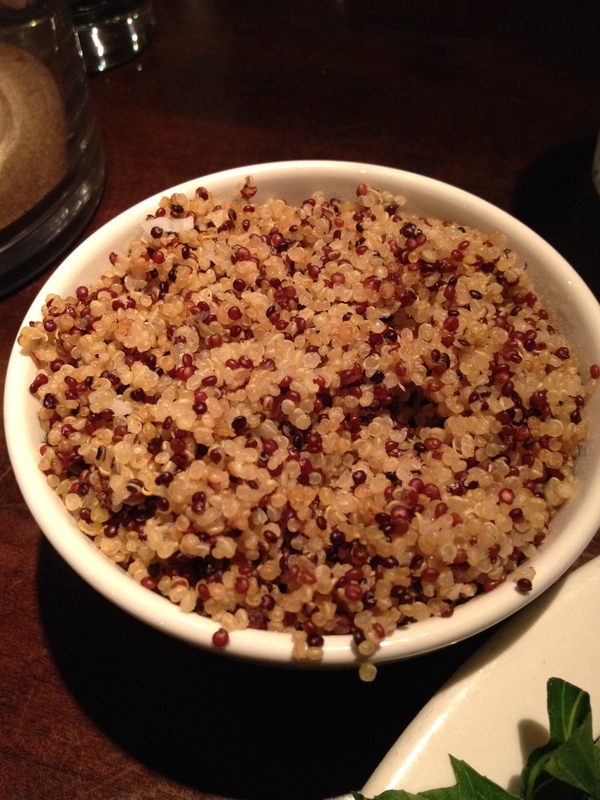 The quinoa is a very recent addition to the menu, but you have to pay an extra $2 for it. Since I like quinoa better than rice, I’m willing to pay the few extra dollars. I thought it went well with the Buddha’s Feast I ordered, but it seemed out of place in an Asian restaurant. My dad ordered it with his Ginger Chicken with broccoli, and he said he preferred rice to it. (He normally loves quinoa, too). I’m not sure what brand of quinoa they use. My waiter tried to find out, but was unsuccessful. However, he talked with the chef who said the quinoa just passed an inspection from a gluten-free council so he said it was most likely processed in a gluten-free facility. Another great step that P.F. Chang’s takes to prevent cross-contamination in its restaurants is to serve all gluten-free dishes on special plates with the P.F. Chang’s logo on this. This ensures that the meal has been prepared gluten-free since all the options are also available on the regular menu. I’ve had problems several times with out-of-place vegetables and noodles on my plate that are not supposed to be in the Buddha’s feast. Yet, due to this separate preparation, I’ve never been accidentally poisoned by gluten. Despite those few scares, P.F. Chang’s is one of the few chain restaurants that I keep going back to. Not only do they offer two gluten-free and vegan menu options, they also really “get” how to handle celiac customers. ← Travel Destination: Disney World!